A group of BYU health science and computer science researchers tracked public-facing twitter mentions of the ADHD medication Adderall between November 2011 and May 2012. The results showed that there was an average of 930 mentions per day. The analysis did not sort out “legal” versus “illegal” use, but Adderall tweets spiked during finals periods on December 13 and April 30. The research also supported previous research that shows that college student abuse of ADHD medications do so during times of academic stress and are not used as a party drug. The Adderall tweets are also most common amongst college and university clusters in the northeast and south regions of the United States. 9 percent of Adderall tweets mentioned another substance, usually alcohol and stimulants like coffee or Red Bull. Other substances included cocaine, marijuana, methamphetamines, and depressants such as Xanax. These tweets are concerning because of the increased risk of morbidity and mortality when substances are combined. 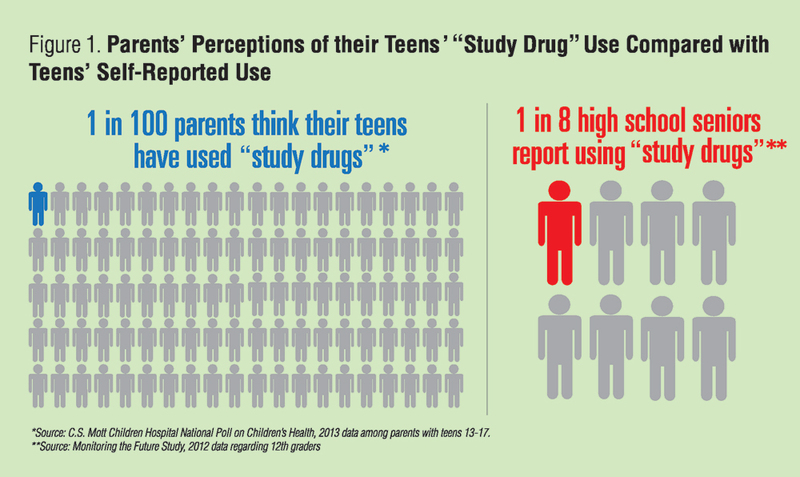 Although there is evidence of widespread abuse of Adderall and other “study drugs”, only one in 100 parents of teens 13-17 years old believes that their teen has used a study drug. There is a clear disparity between what parents believe and what their children are reporting. Sometimes students without ADHD take someone else’s medication in order to stay awake and alert to try to improve their grades. However, taking study drugs has not been proven to improve students’ grades. There are also many dangerous side effects of taking these medications when they are not prescribed such as acute exhaustion, abnormal heart rhythms, and even confusion and psychosis. Misuse of stimulant medicines has also been associated with risky behaviors such as unsafe sexual activity and gambling. There is widespread need and desire to crack down on students’ use of prescription stimulants to achieve academic excellence. Click here for an article from USA Today about proposed policy changes. Articles referenced are from ScienceDaily (May 1, 2013), ScienceDaily (May 20, 2013), and University of Michigan C.S. Mott Children’s Hospital.